This is an AP-Illinois Exchange story offered by The (Dixon) Telegraph. DIXON, Ill. (AP) — Mike Smith describes his daughter, Brooklyn, as "self-driven and very competitive." But when it came to reading, the motivation used to be lacking. "It just kind of didn't keep my attention," said Brooklyn, 8, a third-grader at Jefferson Elementary School. Her big sister, Sarah, always has been a bookworm. But it wasn't until Brooklyn met her teacher, Dorry Kingry, and her veritable treasure trove of books that she got hooked on books. "When Mrs. Kingry passed out Laura Ingalls Wilder's ("Little House on the Prairie"), I really liked that book," Brooklyn said. "It was an adventure, and I saw that horses can swim. I learned a lot of things about back in the old days." "I'd say that book was what started it," her mom, Audrey Smith, said. "She told the neighbor lady about it. Then she told her about 'Anne of Green Gables,' and then she got that book. I always thought it would be 'Diary of a Wimpy Kid,' or something, but no, it was that book. 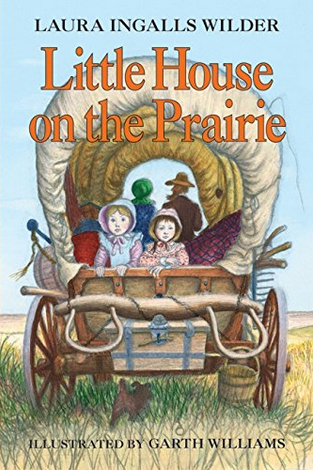 She wanted to be Laura Ingalls Wilder." And this year, Brooklyn's Christmas wish list was topped by a reading tablet and books. Mom and Dad delivered, Brooklyn said. "It was in a box, and I was like, 'What's in it?'" Brooklyn said. "Then I opened it, and was like, 'Oh, my gosh.'" "And then we didn't see her the rest of the day," Audrey said. Brooklyn no longer is just reading words, Kingry told Audrey, but is into reading concepts. "I'm remembering the books in my head," she said. In her first year as principal at Jefferson, Crystal Thorpe implemented Turn off the TV and Read, a program that she used in the same position at Dakota Elementary School, and that she admits she "borrowed and tweaked" from her 8-year teaching stint at Washington Elementary School in Sterling. During four Tuesdays this school year, students are encouraged to turn off the tube and spend time reading with a parent, for 5, 10, 15, or 55 minutes - however long they'd like. It gets the parents involved in the learning process, and it's up to the students what they read. The loose requirements are at the core of the district's mission to show kids the appeal of reading. Two years ago, the district cut ties with the Accelerated Reading program, which rewarded kids for reading more challenging material but led to a lot of memorization and recitation - at a cost of $5,000 per year. "It is a costly program, and when we looked at assessment, we just weren't seeing the direct impact from the program," Superintendent Margo Empen said. "And we were looking at other programs that might have direct impact." Thorpe was one of several principals who wanted to ditch Accelerated Reading. "We don't miss it," she said. "The students would earn points, and they were reading for answers to questions. Literacy is so much more than reading for answers on a test. I don't care how many AR points a book is worth, as long as it's worth something to the child." Similarly, last year, Madison Elementary School replaced AR with Battle of the Books for its fourth- and fifth-graders. Empen got the idea from her nephew, Cade Empen, a seventh-grader in the suburbs who gushed about the Scholastic Bowl-style program in which each team of five to six students must read 30 books, culminating in a competition in May. Sarah Smith took part last year, and read 53 books. And now it seems another Battle of the Books combatant is coming down the pike. "I used to have a bookshelf in my room, and now it's in Brooklyn's room," Sarah said. Both programs' costs are negligible and funded by PTO fundraising. "It's a win-win situation," Madison Principal Joseph Sagel said. "Not only is it a great event that students enjoy, but it's also helping teachers build up their classroom libraries. That's one of the best things we can do for literacy." Programs for sixth- through eighth-graders at Reagan Middle School are in the works. But often, the programs are only as powerful as the teachers who implement them, and Audrey Smith lauds Kingry. "This is Brooklyn's year, and Mrs. Kingry has really found a way to hone Brooklyn in on what she loves to pay attention to. She's such a great lady." About 130 students participated in the first Turn off the TV and Read Tuesday, and this past month, the number jumped to about 170. Kingry, who had seven students miss out the first time because they missed class that day, had everyone participate the second go-round. "When they heard about the books the other students had gotten and read, they wanted to be part of that," Kingry said. Her students also fill out a reading log every night - 15 minutes is required. No problem, Brooklyn said. In fact, she reads for half an hour every night. She loves her chapter books, and can't get enough of books about animals. She'd like to be a veterinarian when she grows up. But the best part of this story? Brooklyn would also like to volunteer to read to children.